Forsythia occupies a special place in the hearts of gardeners, since this very plant often heralds the thawing of the ground after a long winter. This plant thrives in full sun to produce full blooms but can tolerant partial shade (4 to 6 hours of sun each day). Forsythia requires very basic maintenance to keep the plant healthy. By far, the most important aspect to keep the shrub healthy lies in adequate year round care. In order to winterize forsythia properly, you must have a healthy plant. Keep the plant healthy with proper year-round care. All plants must withstand cold soil and air temperatures, freezing and thawing and the winds of winter. The only way they can handle these harsh conditions is with adequate care during the rest of the year. Forsythia requires regular watering so include this shrub in your watering regimen throughout the growing season. Water at the base of the trunk instead of the leaves and flowers. Assure that the plant receives full sun and adequate water during the growing season. 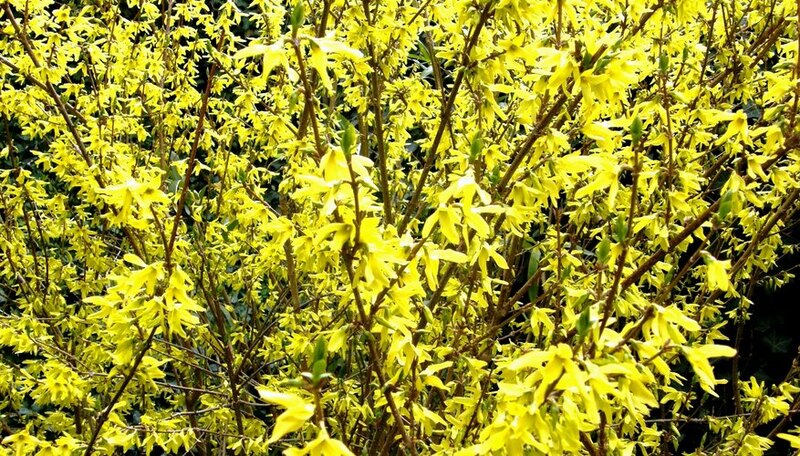 Forsythia can grow up to 10 feet tall and 12 feet wide with proper growing conditions. Mulch around the base of the shrub to help retain moisture and keep soil temperatures even during the winter. Don't pile the mulch around the trunk of the plant since this can invite pests and disease. Prune the forsythia after it blooms to keep the plant healthy. Clip off old wood with a 45-degree cut close on various branches near the main stem of the plants. The "thinning" type of pruning rejuvenates a plant and opens up the inside of the shrub to encourage new growth. Do not shear the forsythia with hedge clippers since this will ruin the natural shape of the plant. Allow the plant to drop leaves in the fall, as any deciduous shrub should. Clean up the leaves to prevent growth of molds. Apply a 4-inch layer of mulch over the plant if you've performed a rejuvenation pruning that reduces the plant to below 6 inches of its center trunk. The layer of mulch will keep soil temperature even throughout the winter to protect the forsythia's roots.